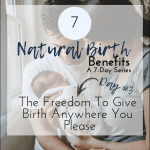 Another benefit of having a natural birth is having a deeper connection to the birthing process. Not having my senses numbed by labor analgesics and feeling every change and movement that was taking place within my body, was extremely empowering. Both times I knew that my body was physically there, but I also felt like I was on another planet. Just me, and my baby. Although labor was intense, being able to feel my babies move down my birth canal, and being able to read my body and flow the way it wanted me to was really beautiful and liberating. Many moms also report that they too have felt more connected to their child birthing experiences with a natural birth. I believe that it’s because you are fully there. Your senses aren’t numbed so you don’t need guidance, your body’s natural physiological processes aren’t hindered, and your able to pick up your body’s signals. 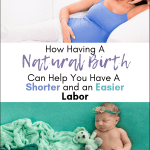 With an epidural (most commonly used form of pain relief for labor), you are numb and you have to rely on your birth team to assist and coach you, rather than relying on your natural senses. Not being able to feel your way through childbirth can make you feel as if it’s a process that is happening to you, rather than a process that you and your baby are both going through together. Childbirth is a deeply intense, primal, and supernatural process. Going at it unmedicated can definitely give you a greater sense of connection and that in itself is very gratifying.